Nowadays, the most infamous rumble in the real estate market is “Multifamily Investments.” Many investors,as well as realtors, home shoppers, and financial institutions, are eager to know if investing in a multifamily property is better than putting hundreds of thousands of dollars in a single-family apartment. The answer to this question is a bit tricky. Many real estate investors think that multifamily investing is the best way to quit the rat race and get their hands on a six to seven figure cheque without much difficulty. According to experts, single-family investors are now graduating to multifamily apartments as they can easily replace their current income with mere 2 or 3 deals and make a killing within 2 to 4 years. 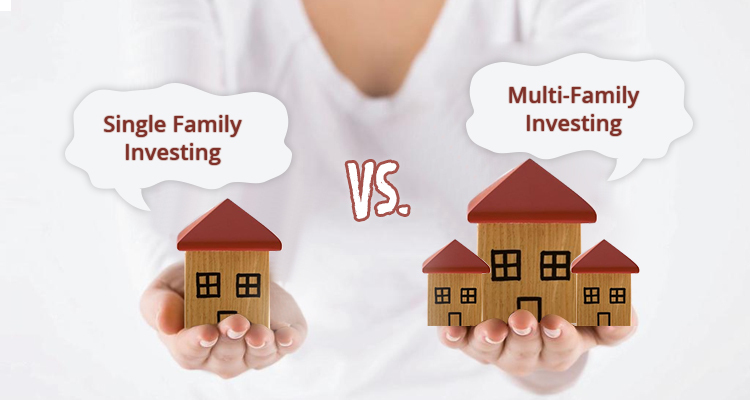 If you are interested in finding out what’s drawing single-family investors to this niche and how multi-unit investing is surpassing single-unit, this blog post is your best bet. So, without any further ado, let’s get started! It’s self-evident that the condition of the US housing market became more severe when the combined worth of all homes climbed to a new record of $31.8 trillion in January 2018.In addition to that, there was 3.3 percent decrease in the mortgage application, despite underlying housing demand remained buoyant. High rents & home prices, strong demand, and low-housing inventory have started an uphill battle for single-unit homes.It has augmented the bidding wars and unhealthy competition among realtors, investors, and other real estate companies. In such circumstances, multi-unit properties provide better opportunities to scale up your business quickly as compared to single-unit residential apartments. For those with really big goals, investing in multifamily properties can help them make some big leaps by increasing efficiency, getting higher return on investment (ROI), and growing an exclusive portfolio of the properties. Sounds amazing, isn’t it? Also, you don’t have to shell out thousands of dollars to re-landscape and maintain each property separately, which will help you achieve an economy of scale and decrease marginal, labor, and management costs. Every single dime saved from these expenditures is directly added to your bottom line, thereby increasing your yield, productivity as well as efficiency at the same time. For example, investors will spend less time, energy, and money to obtain 20 home units in a single real estate building with only one investment than 20 individual residential properties with 20 investments. Undoubtedly, structural changes, improvements, and refurbishments are some of the most challenging parts of fix and flip real estate investing. Flipping houses is a fantastic way to make a killing, gain experience, and build a good rapport with builders, attorneys, investors, etc. At the same time, however, it can be risky as you can lose your hard-earned dollars in lieu of making a quick profit. control the value of your properties. For a quick understanding: If you build a pool or play area for kiddies in the community space, you add the value to your whole building, not just one single unit. It is one of the primary reasons why investors are deciding to step up from single-family to multifamily real estate investments. Compared to a residential single-unit apartment, a multifamily property is valued based on its net income and not comparable sales. It gives investors direct control over their assets and income. Not only they have all the freedom of rising or adjusting the rents but also making enhancements and increasing operational efficiency. The US housing market is changing and emerging continually, and so are the preferences of real estate investors. They are making their way to multifamily investing to supplement the retirement income, take control of their financial destiny, and get ahead of the curve.However, both single and multifamily investing have their own perks and drawbacks. So, decide wisely and choose the one that best suits your business goals and aligns perfectly with your long-term business strategy. If you need more information on multifamily investing or want to buy a multi-unit property, then contact us for a quote. Call us at (909) 377-3137 or drop a message at bb@arrowbcd.com.